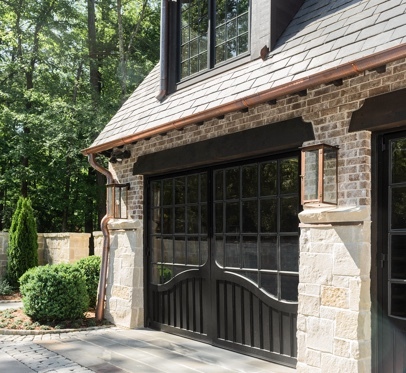 Christopher Architecture and Interiors offers tailor-made, out-swinging carriage garage doors that add a level of luxury to an often overlooked space: the garage. When so much intention has been devoted to the design of a home, the garage should receive equal consideration. Our authentic carriage doors add a distinguished uniqueness. 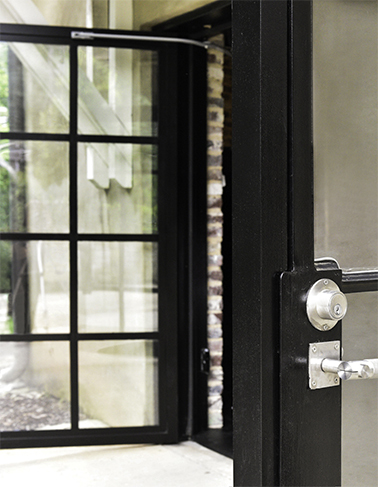 With side hinges, our doors are out-swinging and function like a front door, but on a grander scale. These custom garage doors are close-fitting, can include standard handles and locks, and are sealed from weather. We can take your home design a step further with matching entry doors and windows. Elevate your space to an unexpected level of luxury, custom-designed just for you. Contact us to get started. Turn your entrances and exits into beautifully refined moments to be experienced. The out-swinging movement releases you to accomplish great things and welcomes you home at the end of your day. Choose from the eight show-stopping designs below, or we can work with you to design doors that are one-of-a-kind and complement your home’s architectural style. If you are unsure of your home’s architectural style, we are more than happy to talk with you to help you discern which one is best suited for you and your home. We offer our designs in four standard sizes: 9’ x 7’; 9’ x 8’; 10’ x 7’; and 10’ x 8’. Should your opening not conform to one of these sizes, our designers can create custom sized doors to fit your home. It’s a timeless style that exemplifies elegance and comfort. Traditional styling is perfect for those who love antiques, classic art pieces, symmetry and other design elements that are rich with history. Traditional design prides itself on its harmony, order and friendly charm. A modern style that showcases simplified form and clean lines, functionality and openness, generous use of glass, lack of ornament, emphasis of rectangular forms and horizontal and vertical lines. This design follows the Craftsman-style architecture inspired by the early 19th-century movement to revive handicrafts. Elements include natural materials: wood, stone, and brick; a dominant fireplace and large chimney; porches with thick square columns and stone supports; and low roofs with wide eaves. A design that will elevate the look of a home with a farmhouse architectural style. Aptly named for houses first built on farms, this style usually boasts board-and-batten siding, either vertical or horizontal, shaker-style cabinetry, exposed reclaimed beams, wide plank floors, deep front porches, and metal roofs. Without ascribing to a particular architectural style, these doors can complement any home while drawing on the original carriage-door designs that helped define the horse-and-buggy era. Ranch architecture combines modernist styles with American West ideas of wide-open spaces. A long, close-to-the-ground profile and an open layout are key characteristics of this style. This style represents the embellished doorways and half-timbering that are easily recognizable in Tudor-style homes. Tudor architecture is an English style that developed in the 15th century. Steeply-pitched gabled rooflines, groupings of windows, and an emphasis on vertical lines are traits of this architectural style. For the discerning home owner who would prefer the security of a solid door, this design is entirely aluminum with no glass. Within the design you choose is an optional feature that sets Bespoke Forged apart from other garage door companies. A door within a door, our “man door“ functions as a point of entry without having to open the entire unit. A brilliant pedestrian detail, this amenity simplifies your coming and going. Absolute combination of design and function. The electric door openers operate quietly and eliminate the ugly ceiling tracking. The precise seamless metal work and glass inlay construction is strong and projects artesian craftsmanship. The beauty of these doors is truly unique. Our authentic craftsmanship reflects the quality and sophistication that define your life.